ZOOM! SPECIAL OFFER until June 30th. 2017. Special $350. Give yourself the gift of a great smile. The Zoom! Chairside Whitening System is a scientifically advanced tooth whitening procedure. It's safe, effective and fast, very fast. In just over an hour your teeth will become dramatically whiter. Zoom! Chairside Whitening is ideal for anyone looking for immediate results. The convenience of Zoom! In comparison to days of wearing trays or strips, makes it the perfect choice for the busy individual. The Zoom! In-Office Whitening System will make your teeth dramatically whiter in a little over an hour. The procedure is simple. It begins with a short preparation to cover your lips and gums, leaving only your teeth exposed. The Zoom! Clinician then applies the proprietary Zoom! Whitening Gel, which was designed to be used with a specially designed light. The light and gel work together to gently penetrate your teeth, breaking up stains and discoloration.With proper care your smile will sparkle for years. A: Zoom! is a bleaching process that lightens discoloration of enamel and dentin. You may have seen the Zoom! process used by me on ABC’s Extreme Makeover. : There are many causes. The most common include aging and consumption of staining substances such as coffee, tea, colas, tobacco, red wine, etc. During tooth formation, consumption of tetracycline, certain antibiotics or excessive fluoride may also cause tooth discoloration. A: Almost anyone. However, treatment may not be as effective for some as it is for others. Your dental professional can determine if you are a viable candidate for this procedure through a thorough oral exam, including a shade assessment. A: The Zoom! light activated whitening gel's active ingredient is Hydrogen Peroxide. As the Hydrogen Peroxide is broken down, oxygen enters the enamel and dentin, bleaching colored substances while the structure of the tooth is unchanged. The Zoom! light aids in activating the hydrogen peroxide and helps it penetrate the surface of the tooth. A study has shown that use of the Zoom! lamp increases the effectiveness of the Zoom! gel by 26% or more, giving an average improvement of up to eight shades. Light sensitive individuals, including those undergoing PUVA therapy (Psoralen + UV radiation) or other photochemotherapy, or patients with melanoma, should not undergo the Zoom! in-office procedure. Also, patients taking any light sensitive drugs or substances, whether over the counter, prescription or homeopathic, should consult their primary care physician prior to the procedure. Anyone who is not eligible for Zoom! 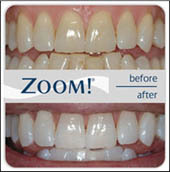 Chairside Whitening for these reasons may be an excellent candidate for Zoom! Take-Home. A: Sensitivity during the treatment may occur with some patients. The Zoom! light generates minimal heat which is the usual source of discomfort. On rare occasions, minor tingling sensations are experienced immediately after the procedure, but always dissipate. You can also ask your dentist to supply you with anti-sensitivity toothpaste for use prior to treatment.